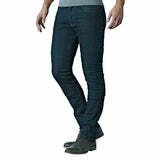 Click here to be notified by email when Draggin Twista Kevlar Jeans - Indigo Blue becomes available. 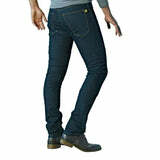 Twista jeans from Draggin are a super casual design kevlar jean, with no external stitching and a skinny leg style. The stretch material allows for a fitted look whilst keeping you flexible enough to throw your leg over a bike. With two decades in the business under their belt, Draggin Jeans are the number one casual motorcycle clothing brand around the world thanks to their dedication to your safety and their attention to detail. Using pioneering methods to combine the worlds strongest fibres in order to create a lightweight inner lining that isn’t just comfortable but literally saves your skin. 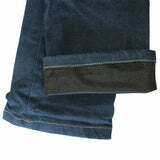 This level of detail is what has made Draggin Jeans the only casual clothing brand to pass CE Abrasion, Burst and Tear tests across their huge current range of motorcycle Kevlar jeans and hoodies.